We have enjoyed RVing over the years, but lost our last RV in a highway crunch. One thing we did not enjoy about RVing was the 10 mpg gas bills and the 2 lbs per mile of CO2 emissions. 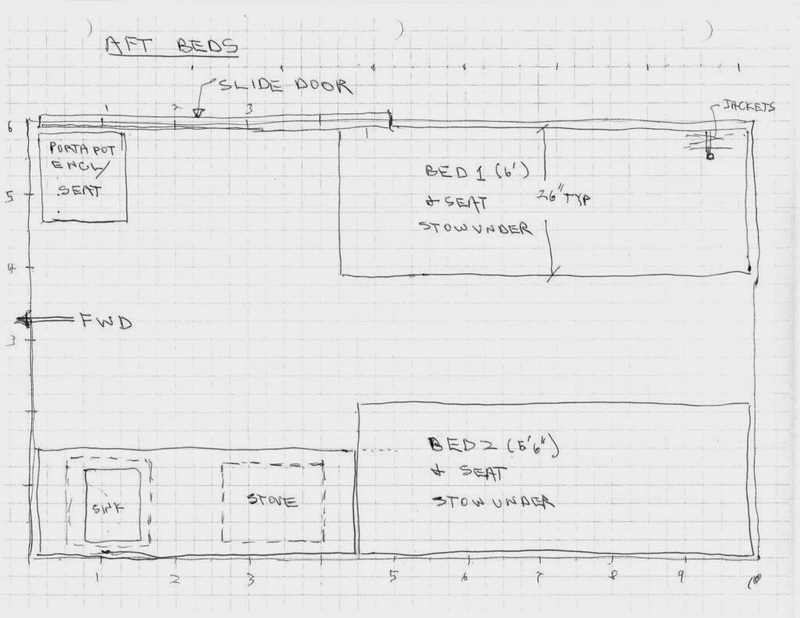 So, this project is about getting back into RVing with a smaller footprint. It was the smallest and lightest vehicle we could find that we think will also provide enough space and stand up height. Just as an aside, it would be very interesting to see what could be done with an even smaller vehicle -- maybe something like the Ford Transit Connect -- a 30 mpg RV! So, this is going to be a several month project, and I'm just going to be adding to it as things go along. I'd very much like to hear ideas, comments, and suggestions that we might be able to incorporate as things progress. 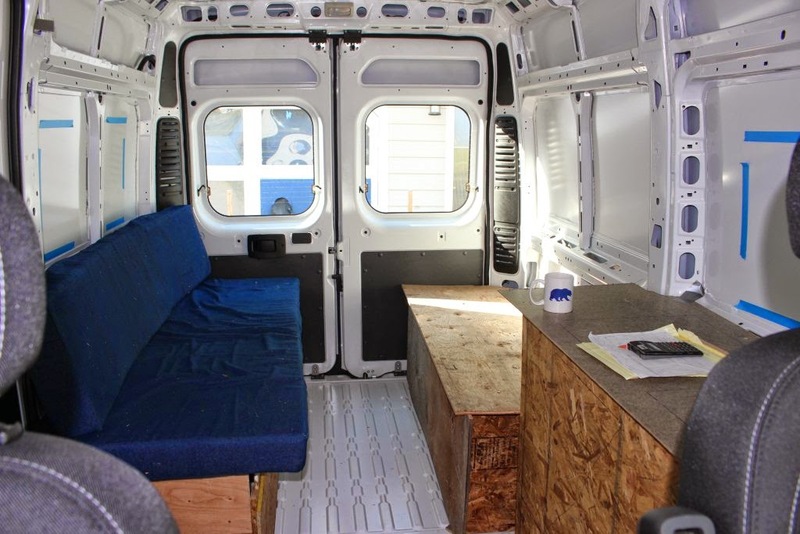 The two beds are in the back and make into a seating area during the day, galley is on right behind drivers seat. There will be some more storage cabinets around the edge up high. New windows will be added in 3 or 4 locations (about where the blue tape is). We like this nice open feel of this and the high quality beds. Did the insulation of the walls and ceiling using spray foam polyurethane insulation. I used one of the two component kits that provide the two pressurized bottles and spray nozzle and hoses. Had never used one of these kits before, but it worked out pretty well. 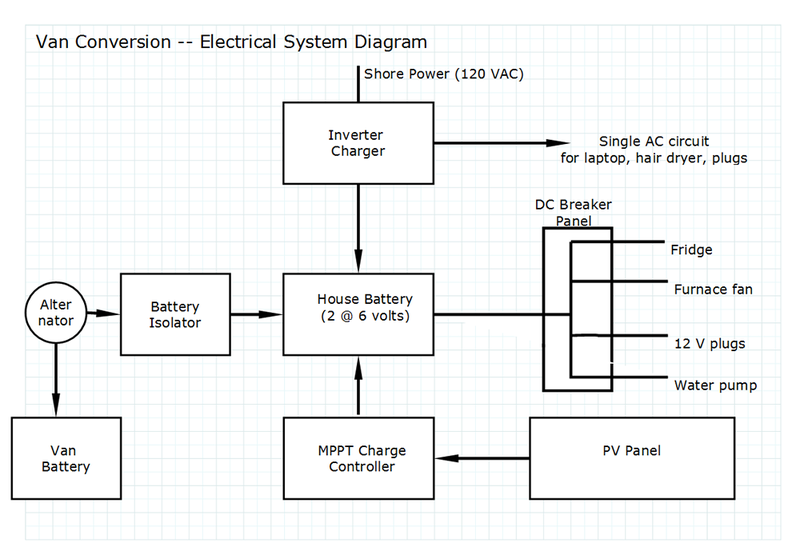 I've been working on the electrical system design. Its a bit more complicated than I would like in that we want to be able to spend a couple days (or more) away from hookups. It has a fairly large battery and the battery can be charged via solar (on the roof), the van alternator, or from shore power. I've worked out a tentative list of components. Would appreciate any comments on the design or the components. Today's project is the floor. Instead of a porta potty, it might be worth looking at one of the "composters" such as the C-Head. We do our RVing on the water in a sailboat. We have had porta-potties (not so great), wag-bag setups (even worse), and currently a marine head with a 10 gal holding tank (which has it's own issues). I know of 3 popular marine composters ( Air Head, Nature's Head, and C-Head). I will eventually be putting a C-head on our boat. Also, on the solar. Solar PV is great on our boat. Between the diesel motor that rarely runs, and a 65 watt panel and cheaper PWM controller, our batteries are always up. Our use is much smaller than yours will be, as we have no refrigeration or furnace to worry about. All interior lights and mast light are LED. We also charge a couple of tablets and phones, etc and run a chart plotter, radio, and wheel pilot. The warm LED strip lights mentioned in this blog are great. I put them on either side of my boat interior with dimmers. They use very little power, and you can cut the strips to fit the application. Best of all, they're cheap. Great Minds Think Alike!!!! I've been drooling over the RAM Promasters trying to conceptualize a way of shaping it into an RV and here it is!! Already in the works!! You're an inspiration!! Please keep posting.. and include videos! of Everything! Make a youtube accnt for this build and flood it with videos! Very excited to see this in action! Best of Luck! Hi -- Should have some new stuff on the camper pretty soon. Did not get much time to work on it in Aug, but Sep is working pretty well. The more I work on the ProMaster, the more I like if for a small, efficient RV/Camper. Hi -- I should have the rest of the material up soon -- next couple days for beds, galley, furnace and propane system. At that point I think its done enough to give it a trial run, but probably after Christmas. It will be a bit of challenge to sleep four, but should be possible. Hi I like your conversion and the reasons you made your choices. 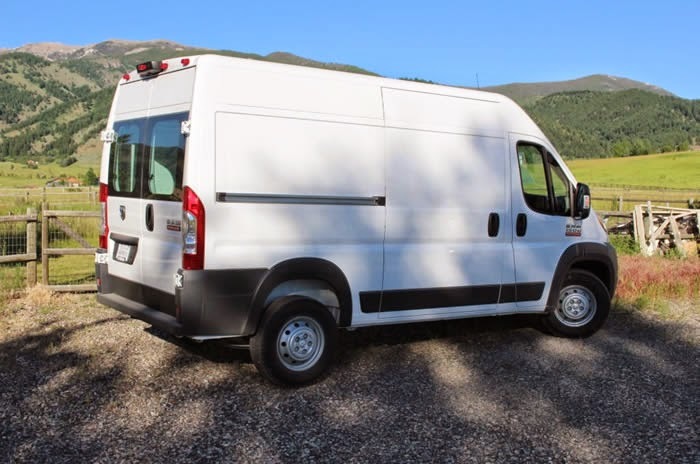 I was wondering if you or anyone on this thread knows of an add a room or awning with an add a room or screened porch that fits these vans, I see online that there are some for the fiat version but don't see any for sale in the US yet. Eurocamper.com has some stuff that might be along that line -- they have some roll out awnings and an "add a room" gadget -- don't know about the screening part. You might check in on the ProMaster Forum in the section they have on conversions -- in particular, ask Steve about his conversion, which uses 2 of the roll out awnings -- I would think he would know about any screening options? Hi, thanks for the info. I'll check with them.